Are you a victim of nipping and play biting? Do you even know what it is? It's very natural for puppies and dogs to mouth and nip. They explore the world around them using their mouths - to a dog, his mouth is as important as our eyes and hands are to us. It's important to note that nipping is not true aggression: it's a form of communication, interaction, exploration, and play for the puppy. 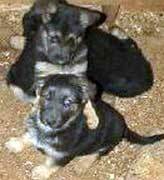 German Shepherd puppies use their mouths to explore their den, their mother, and their litter mates. As early as a few weeks old, they begin to use their mouths to play with their siblings: puppies play by biting and mouthing each other. Nipping and play biting is essential at this time in their lives. puppies play by biting and mouthing each other. Nipping and play biting is essential at this time in their lives. Some adult dogs - usually, those with owners who encourage rough play, or those who were removed from their litter at way too early an age - retain these same tendencies to nip during play and also in moments of emotional duress. This playful biting and mouthing of your hands and clothes is particularly common among puppies, but can also occur in older dogs that haven't been taught proper bite inhibition. Sibling play is actually how young puppies begin to learn a very important lesson, called bite inhibition. If a German Shepherd puppy bites another puppy too hard, the other pup yelps loudly in pain and stops playing with him. This teaches the biter that such a degree of bite force results in an undesirable outcome: social isolation. Next, whenever other puppies bite him he learns what pain really feels like. (This is one of the main reasons that puppies that are removed from the litter way too early are often "maladjusted" - they've missed out on some of the important lessons their mother and litter mates have to teach them). Even those puppies that have already learned basic bite inhibition from their siblings usually need to be reminded again upon entering their new home! It's true! People aren't covered with fur and are much more easily hurt from biting than dogs, so it's necessary for us to refine the puppy's bite pressure even further. A dog that does not have any concept of bite inhibition can be annoying but also potentially dangerous to have around: a harmless play session can rapidly turn into a painful ordeal. Compared to adult dogs, puppies aren't capable of inflicting really serious damage - although their little teeth are razor sharp, their jaws are too weak to do much more than elicit a trickle of blood - however, an adult dog can do a great deal more than just scratch the surface, and it makes very little difference to a wounded human that the dog "didn't mean to do it"! So, here's a few suggestions on what to do to teach your dog good bite inhibition and to reduce nipping and play biting in your dog. Note: this same technique is applicable to older dogs, although the same results may take a little longer to attain. • Whenever you're playing with your puppy or dog, you'll need to know ahead of time what the level of mouthing that you're prepared to accept is. Some owners don't mind if their dogs touch their hands with their teeth, as long as no pressure is exerted; other owners, particularly those with large, strong-jawed dogs, prefer to pass along the message that no tooth-contact is acceptable - whatsoever. • Here is the cold-shoulder technique for nipping and play biting. It is the most effective, and humane, manner of conveying your displeasure to your dog. During play your puppy might give you a good nip - more than you're willing to accept. If so, squeal shrilly and loudly in pain and immediately turn your entire body away from him. Get up and walk a few paces away from him, keeping your face and eyes averted from the puppy. Don't speak to him at all, and don't touch him either. The aim here is for the German shepherd puppy to be completely socially isolated for the next 20 to 30 seconds - long enough for this lesson to sink in, but not long enough for him to forget what it was that caused such a response in the first place and to start playing with something else. (Note: if there are other people around during this training, you'll need to make sure that they mimic your behavior as well - in other words, don't allow them to start playing with the puppy or dog, or else all your good work will have been for nothing). • To keep the focus off your hands during play, and to prevent him from learning what a delightful chew toy your fingers really are, supply him with a more appropriate chew toy such as rawhide bones, pigs' ears, or a squeaky dog toy. • If he should snap at your hands or face while playing, correct him quickly with a sharp, "No!" As soon as he stops, praise him and then quickly redirect his attention to an appropriate chew toy. As soon as he takes the toy, praise him again. • Never use physical force to correct your dog for inappropriate chewing or mouthing. In most cases this will even actually encourage further nipping and biting from your dog. Give him 30 seconds of isolation instead of the corporal punishment. • If for some reason the cold-shouldering technique does not work for your dogs nipping and play biting behaviors, maybe your dog is just really worked up from the play session, he might need to cool down a bit. In this case, the 'time out' method might be appropriate. Take him to a small room by himself, and leave him there for five minutes or so to chill out. When he's calmer bring him back in. • Avoid rough play like slapping around your dogs head or face and full-on wrestling matches at all costs with your dogs. These kinds of rough games do nothing but encourage nipping and play biting. Keep all games with your dog friendly and low-key at all times to discourage any form of nipping and play biting. For more information on how to deal with typical doggie behaviors such as nipping and play biting, including a fantastic resource for dog training how-to's and loads of detailed information on preventing and dealing with problem behaviors, check out The German Shepherd Handbook, written by a professional dog-trainer, it's an great guide that deals with all the subjects a responsible dog-owner could ever want to know about and it's well worth a look.